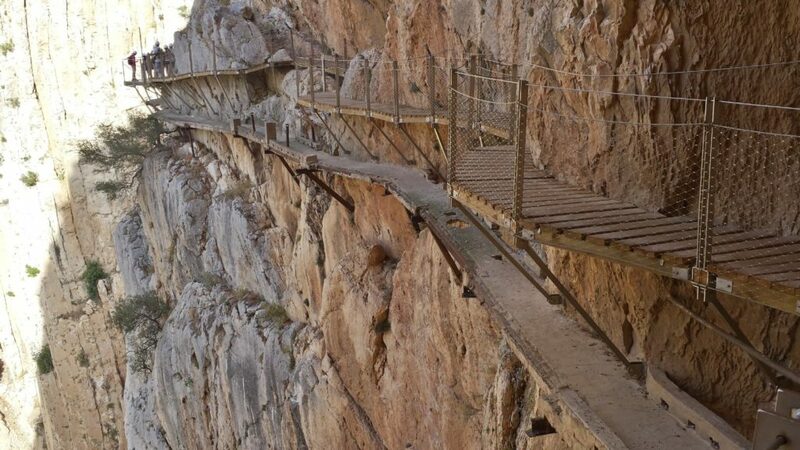 The Province of Malaga in southern Spain is home to what was once dubbed “the most dangerous path in the world”. 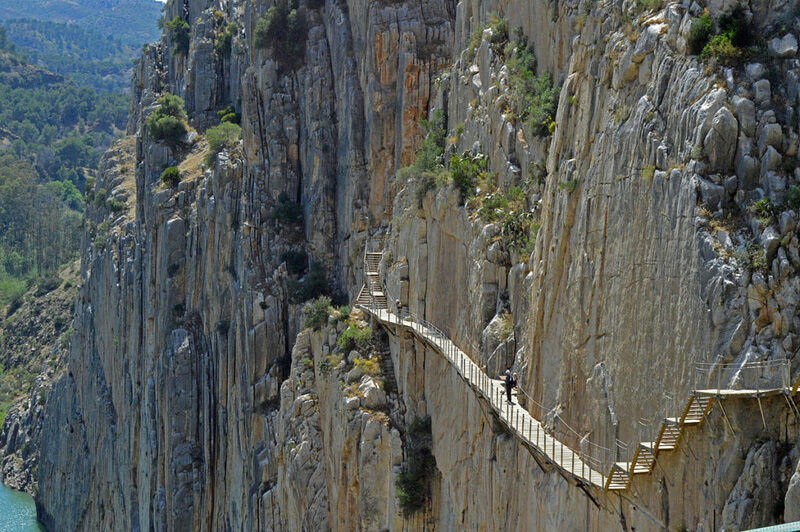 Popular with thrill-seekers the world over, El Caminito del Rey (or The King’s Little Pathway) is 3 feet-wide, and set against a mountain face, hanging 300 feet above ground, over the Guadalhorce river.The path was built at the beginning of the 20th century as a crossing for workers at the local hydroelectric power plants. It received its name – The King’s Little Pathway – in 1921 after King Alfonso XIII walked on it, officially opening it to visitors. The path suffered massive abrasion over the subsequent years and became increasingly dangerous to walk. 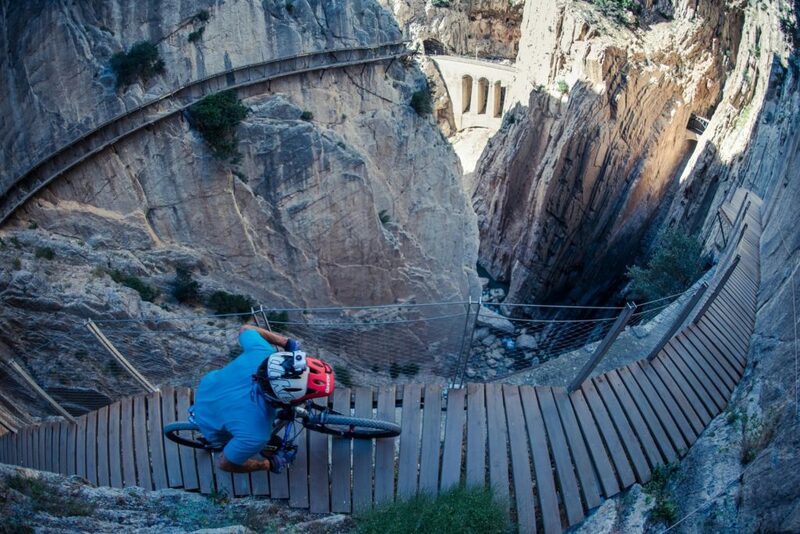 Following several fatal incidents, the path was officially shut down by the Spanish government in 2001. At that point, the handrail was missing in several places, many parts of the concrete floor had collapsed, and the safety cable had snapped on a few occasions. The daring continued to brave the unsafe conditions, as well as the hefty fine if caught trespassing and kept walking the path, prompting local authorities to launch a renovation project that eventually came to fruition in 2013. Unfortunately, in the years between the path’s closing and the beginning of the renovations, there were four fatalities of hikers who attempted to walk the path. The path was reopened a couple of years ago, in 2015, after extensive renovations that cost millions of euros to the local municipalities, and included the construction of an entirely new path from more durable materials, as well as payment for staff that maintains the path on a regular basis. In addition, strict security requirements were put in place; among other things, visitors are now required to wear hard hats, no more than 400 people are allowed on the path at the same time, and no more than 600 visitors may walk the path each day. The newly restored path is 4.8 miles-long and takes the average hiker between 3 and 5 hours to complete in full. While the path is now much safer to walk following the renovations, thrill-seekers may still enjoy the stunning views over the path’s rail, as well as through the glass platform that was installed on the floor of a part of the path. The remains of the original path, which is now over 110 years old, may be seen below the new one. They offer, along with the plaques memorializing the hikers who fell and died over a decade earlier, a chilling reminder of the risks previous visitors undertook. Visitors are recommended to make reservations in advance on the official website if they wish to walk the path, as well as to check upcoming weather reports first, as the path may be closed in certain weather conditions. Make sure to keep in mind, though, that despite the added security measures, visits to the path are still not recommended for people who tend to suffer from anxiety or vertigo, and are not permitted for children under the age of eight.